On New Year's Day, parade-watchers will witness a Honda Ridgeline-inspired truck rising from the bed of the float in a cloud of mist, become an airborne craft and 'blast off' with a replica of ASIMO, Honda's advanced humanoid robot, at the controls. Using Honda generators to transform, the hood of the truck will fold forward to become an aircraft cockpit, the doors and sides of the truck will unfold outward to become wings, the wheels will tuck under the body, and the bed of the truck will open and take on the form of an aircraft tail section, complete with rocket engines - and even real fire. "When it comes to creativity and innovation, you can always count on Honda to make the Rose Parade spectacular," said Bill Flinn, chief operating officer, Tournament of Roses. "American Honda is committed to creating products that give people mobility - on both two and four wheels, and soon, in the skies. 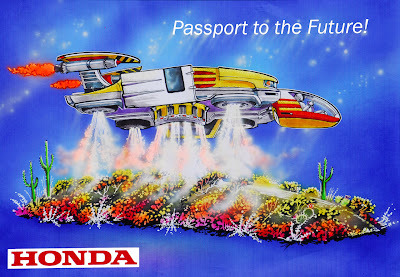 This year's float takes a fun and imaginative look at what the future of mobility might hold," said Steve Morikawa, assistant vice president of American Honda Motor Co., Inc.
Honda Rose Parade entries have captured major awards in 12 out of the last 13 years. 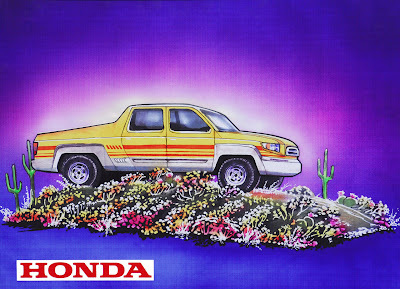 Honda is the official Tournament of Roses vehicle. This year, the company will provide 115 vehicles, 166 Metropolitan scooters and 12 generators for use by Tournament of Roses personnel. The 119th Rose Parade, themed "Passport to the World's Celebrations," will take place Tuesday, Jan. 1, 2008 at 8 a.m. (PST). Fire blasting out of the rocket engines of the Honda float in the Tournament of Roses Parade Tuesday, Jan. 1, 2008 in Pasadena, Calif. 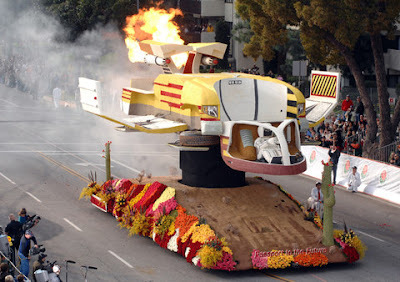 The float which transformed from a truck to take the form of an spacecraft complete with rocket engines and real fire, won the Crown City Innovation Trophy, given for "Best Use of Imagination and Innovation to Advance the Art of Floral Design." Honda has won 13 awards in the past 14 years. Photo/Honda, Susan Goldman, handout.